British coins, their values and varieties, 1760 - 1970. 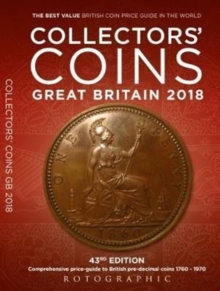 CCGB2018 has fully updated valuations and contains more variety details on British coins than any other publication. With comprehensive listings of all British coins from the fractional farthing to the gold Five Pound coins, including all guineas and their fractions. Varieties are listed and described in detail, accurate market values in up to five states of preservation and annual mintage numbers. It includes the usual wealth of information about the coin weights, sizes and designers. The publisher believes this to be the most detailed coverage of the subject matter available.